Dr Stan Ruecker is at the Digital Literacy Centre’s Summer Institute this week talking about humanities visualization, an alternative strategy to data visualization, and performing workshops with Dr Teresa Dobson (Director of the DLC) on Digital Applications for Knowledge Visualization. One of the tools being examined is the Mandala Rich Prospect Browser. 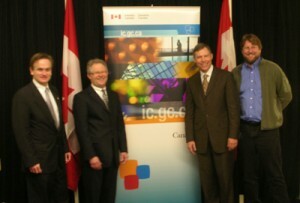 Andrew Saxton (on far left), Canadian Parliamentary Secretary to the President of the Treasury Board, announced millions in funding to social sciences and humanities researchers yesterday, highlighting in particular a multi-million digital literacy project involving members of the Department of Language and Literacy Education at the University of British Columbia. From ancient cave paintings to hand-printed books to Facebook, people have been reading in various forms for thousands of years. But what will the act of reading look like in the future and what can we learn from the past to ensure digital applications enhance and expand the reading experience? That’s what an international team of researchers led by Project Director Ray Siemens (UVic, far right in above photo) and Research Area Leaders Richard Cunningham (Acadia U), Teresa Dobson (UBC), Alan Galey (U Toronto), Susan Schreibman (Royal Irish Academy), and Claire Warwick (University College London) will be studying over the next seven years through their participation in the “Implementing New Knowledge Environments” (INKE) project. Funded with nearly $2.5 million through the Social Sciences and Humanities Research Council (SSHRC) Major Collaborative Research Initiative (MCRI) program with an additional $10.4 million funding in institutional and research partner support, this team of 35 researchers and 21 partner agencies will develop a better understanding of literacy in the digital age. A full list of researchers (including UBC’s Teresa Dobson and John Willinsky), participating institutions, and partners can be found at the project’s website, www.inke.ca.